I read awhile back that somebody said you might learn more from climbing the same mountain 50 times than you would from climbing 50 individual mountains. Hiking trails are much the same. 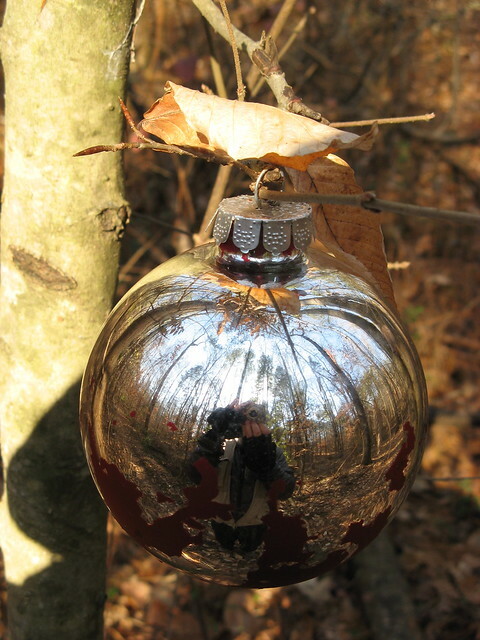 I was on my morning hike the other day and came across a couple Christmas tree bulbs somebody had hooked to a tree. I thought, “wow, that’d be cool picture” so I brought my camera long next time. First thing I realized: the bulb creates a fish-eye effect that makes it nearly impossible to photograph without having the camera in the picture. I shot this from a zillion angles and finally decided heck with it, I’ll stop fighting the urge to hide the camera and see what happens. Another novelty I happened to notice on this trail I’d walked a bunch of times before. 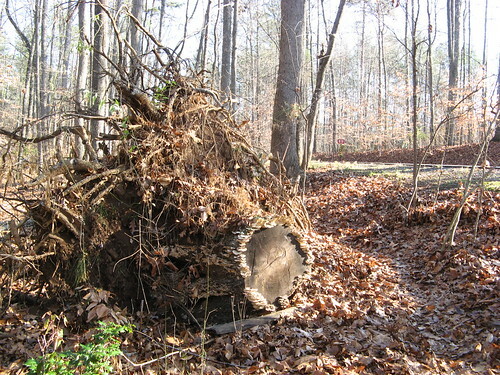 Looks like any old fallen tree, but notice the park road in the background and the angle of the fallen stump: When this tree fell it most likely blocked that road completely. Another of those examples of nature’s seeming delight in bollixing the designs of mere humans. If you spend much time reading about wildlife you’ll come across the phrase “charismatic megafauna” — a fancy way of describing the innate charm of tigers, elephants and other examples of threatened species that are much easier to rally around than, say, a snail darter or a spotted owl. For hikers there’s a similar phenomenon you might call “charismatic megavistas” — mountaintops, cliffs, coastlines, fiords and such that induce gap-jawed wonder. There’s a strong tendency to become so captive of charismatic megavistas that we ignore the possibility for wonder amid the mundane in our own neighborhoods. The trail you can walk to from your front porch cannot possibly be as wonderful as the one that requires airfare and six months of planning. 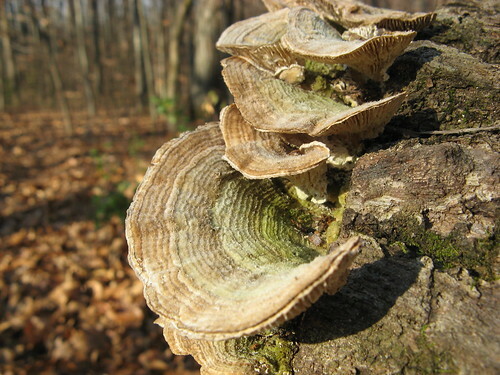 Here’s a closeup of a mushroom on that tree stump. Something about this image transcends the limitations of my battered digital camera and scant photographic skills. Lately I’ve been having a hard time getting motivated to drive a hundred miles each way for a few hours of hiking, and every time I come home with images like these, whether in my camera or in my memory, I can’t help thinking: it’s OK hike the same trail a hundred times. Because as long as I’m paying attention, it’s not the same: different light, different weather, different colors, different state of mind. And most of all: worth doing. Great point Tom- I hike the same 5 mile trail near my house 2-3 times per week year round and it’s always a different experience. Seasons, plants, trees, the slant of the sun, the people I come across – it’s always a refreshing experience even though I’ve pounded those same miles time and again. One of the trails near where I live changes considerably with the seasons but always changes each week it seems. They are truly alive not only due to the fact that there is nature all around but also the people moving through the trail bring with them their own change each time they hike them. Thanks for the post sure makes you think huh? Tom, I totally agree!! I see something new everytime I hike the same old trail or neighborhood streets! Life is dynamic. The statement about “getting motivated to drive a hundred miles each way for a few hours of hiking” really hit home – I’ve been racking up 50,000+ miles each year driving to find new hikes, and I’m starting to question whether I want to be doing that anymore (the answer is ‘yes’, btw, though I can see the end somewhere ahead). I also do a 3 mile walk every lunch hour at the same place I have for the last 20 years, and I’m always struck by how much I see there. When I really want to get crazy I reverse the direction that I traverse the loop, and that reveals all manner of new things. Great post – very insightful and thought provoking – thanks, and all the best to you! Amen, Tom – this is a point that Gambolin’ Man has been hammering home for a long time: the multifarious magnificence and miraculous of the so-called mundane! Nice post. I spend about 40-50 hours on the same trail every year (trailwork). I’m not sick of it yet. I love the early fall, fall, late fall, early winter transitions. I couldn’t agree more. Only when you hike a trail over and over do you really get to know it and appreciate it for all its moods and variety. I’m a walking guide and my guests always ask me if I get bored walking the same trails lots of times during the summer but I never do. The paths change so much during the course of the summer – different flowers are out each time you walk it and the wildlife is always different. I also find I’ve already taken in the big views of the impressive peaks and cliffs so I start concentrating much more on the little details and notice so much more wildlife and flora. I very much like that. Tom! Long time no hear from. I very much enjoyed reading your blog posts and, with Spring having been so beautiful, I thought we’d have heard from you. Are you still hiking? Still Blogging? Just letting you know that you have fans out here! I can completely relate. I often find the most inspiring scenes even when I’m just walking back home from work. The changes in light and weather can make all the difference. I’m part of the KEEN Recess Team, and we’re inspired by people like who take advantage of the outdoors. Our recess page is a place to share your favorite hiking destinations and photos. [http://recess.keenfootwear.com/get-high/] We hope this resource will inspire others to get out there! We would love to have your input and expertise on the page. I used to always only want to hike new trails, but it’s amazing how different the same hiking trail can look at different times during the year, or when you start to search out the small stuff. I can’t wait to move to the Adirondack Park so I can take up hiking. Here in FL it’s just so stinkin’ HOT. Some day, I want to be an Adirondack 46er (hiking all 46 High Peaks), but that’s going to take a while! Thanks for the post, it keeps it all in perspective. New isn’t always better. Great pictures and storytelling. Love the website. we have plenty of stories to tell. on your response. Thanks for your time! P.S. – Sorry to post this on a story, since you didn’t have another contact section this had to do! That is so true. I hiked the same path every week for nearly 8 years and always managed to find something different to look at. The changing seasons can make it look completely different too. Beautiful post. Will have to try it! Your camera can’t be that bad…nice photos!! year, or when you start to search out the small stuff.